Tom Franklin, age 65, widowed, and retired contractor, lived out west of Wickenburg in a small house nestled at the foot of the Bradshaw Mountains. Almost daily he foraged over the rugged Arizona desert in the hot pursuit of gold, silver, platinum, or anything else of value. Even though Tom enjoyed his prospecting, it was really the adventure itself that made each trip worthwhile. This day he’d driven his old ’65 Ford F-100 up a narrow dirt road and parked it near a wide rocky escarpment, streaked with dark mineral veins. He thought at first they might be silver ore, though closer inspection proved him wrong. But that really didn’t matter much to Mr. Franklin. It was just too pleasant of a fall day for any disappointments to intrude on his personal adventure. So Tom gathered up his prospecting equipment, locked the truck, and set off along a game trail, avoiding the ever-present creosote bush and cactus that might harbor an unseen rattlesnake. It was still too early for them to be in hibernation, and one had to be careful with every step you took out here in the Sonoran Desert. He began by working the side of an arroyo with his metal detector, swinging the instrument back and forth. The dry wash bed had cut a swath through the hillside a month before during the last flash flood, opening up a gash in the undisturbed soil. Tom thought there was a fair chance that a few gold nuggets might have washed loose. So far, though, he only detected some hot rocks, and none of the sought after gold that supplied the hobby of his retirement years. Despite the relatively cool day, two hours of swinging the detector had just about worn him out, and Tom stopped a moment to wipe his brow and take a long swig from his canteen. He rested the still active detector coil momentarily on the sand and was immediately rewarded with a loud screech from the instrument. His fatigue momentarily forgotten, Tom raised the metal detector and swung it first one way, and then the other. It sounded like gold, he thought. But it was big, not a tiny nugget—maybe three, perhaps even four inches across, he estimated. Trying to hide his excitement from what was probably just another false alarm, Tom pushed a small spade into the ground at the indicated spot. About six inches down his tool hit something solid. Scraping away the last of the concealing sand, he saw a golden gleam. “Hot damn!” he shouted. “The biggest nugget I’ve ever seen.” Tom found a nugget last spring about the size of his little finger. Tom Franklin carefully widened the hole, scraping the sand out from around the large yellow object. But as he exposed more of its surface, he became less sure that this was a gold nugget after all. Admittedly, parts of the yellow surface were convoluted similar to the natural mineral, and yet the rest was smooth, with almost a shine to it. Tom finally pried it out of the hole and lifted his find up into the bright sunlight. Washing away the remaining dirt with water from his canteen, the golden surface gleamed in the late morning sun. Tom’s opinion that it was a huge nugget quickly vanished, though it still looked like gold, perhaps some kind of alloy. He estimated it weighed perhaps five or six pounds, far less than expected for an object about the size and shape of a small ostrich egg. Turning it in his hands, Tom recognized a machined surface, one side showing obvious damage, the surface crushed inward as if from a terrific impact. He even saw a little residual material that reminded him of nickel or iron, perhaps even a nickel-iron meteorite. He had always kept his eyes open for them, but had never found one. Then, he felt a slight vibration in the object and heard a faint humming sound. After a few seconds, he swore he could almost make out a person’s voice. He drew the object closer to his ear, and listened intently. Yes, it did sound like words, he thought, almost as if someone was speaking over the background static from a distant radio station. Tom gave the object a light tap with his knuckles. The speech grew in volume and clarity until he had no doubt as to what he heard. “No Sir,” the object responded. “As mentioned, I am a Class 2 Probe in service to the Falfax Confederation.” The speech paused for a moment. “So, you’re some kind of computer, from, well, outer space?” The realization of what Tom found was finally sinking in. “So why don’t you just contact this confederation?” Tom asked. The wheels in Tom’s mind were beginning to turn, and he thought of various possibilities. A probe from outer space—what a find! He’d be rich! The government would give him millions of dollars for this. Or would they? Maybe they’d just confiscate it. Then, he’d have nothing. Tom considered taking his find to a private dealer, but he didn’t really trust those people either. He would have to think carefully about the possible ramifications of this discovery. It wasn’t just a big gold nugget that he could sell on the open market. Or was it? Tom took off his pack, placed the golden object carefully within, and grasped his metal detector. He then turned, and trudged back up the arroyo. He found the slope where he came down, climbed back out, and wound his way through the creosote bushes and cactus, finally arriving at his parked pickup truck. Disassembling his metal detector, he placed it in the bed of the truck. The pack with the probe he stuck on the front seat, where he could keep an eye on it. Tom closed the cab door, put on his seat belt, gave the bag a quick glance, and then started the engine. He pulled the truck around, and got it back on the narrow dirt road that was just two wheel ruts in the desert soil. Tom drove slowly, often glancing at the seat where his pack lay. He hadn’t heard anything for a while from the probe. “You still there?” he asked. Tom made a turn onto a larger dirt road and increased speed only a little. He knew well the hazards of driving back roads, including encountering oncoming traffic when you least expected it. “So I was wondering,” said Tom. “Then how do you know this confederation still even exists?” Tom downshifted to make a steep climb. “So what will you do if it turns out the confederation doesn’t exist any more? “And, if your confederation does still exist? What then?” Tom merged onto a major dirt road, wide and smooth, that led to town, and his house on the outskirts. “I see.” Tom turned right onto a narrow dirt road that led to a small house about a hundred yards distant. Tom parked his truck under the sparse shade of a mesquite tree, and brought his supplies inside. He came back out, grabbed the pack, and took it into his shop. The room was littered with a plethora of prospecting equipment, from gold pans to dry wash shakers. In the corner on a steel table rested an electric furnace. Opening the door to the furnace, Tom reached into his pack, grabbed the probe, and placed it in a large crucible. “Sir, what are you doing?” it asked, as he closed the door, flicked on the main power switch, and set the temperature to 1450. “What are you doing?” the probe asked again, though Tom couldn’t hear it through the closed door. He heard no answer from the interior of the electric furnace. Three hours later he turned it off, let it cool to ambient, and checked the result. A solid pool of melted gold alloy lay in the center of the crucible. Tom chuckled to himself, grabbed the crucible with a pair of tongs, and inspected the results. A smile crossed his face. Yes, he’d found a gold nugget after all. 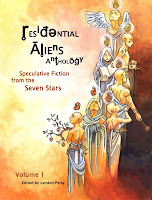 Original fiction debuting at Residential Aliens. William Avett has advanced degrees in science and engineering, and has worked in a variety of technical areas including the aerospace field, providing minor contributions to the space shuttle. However, history, fantasy, and the arts have always held great interest for him. His stories appear or will appear this year in Down in the Dirt and Pens on Fire, as well as (writing as Robert Mitchell) AlienSkin and Down in the Dirt. William lived most of his life in the Sonoran desert of Arizona, but now resides in the state of Oregon. 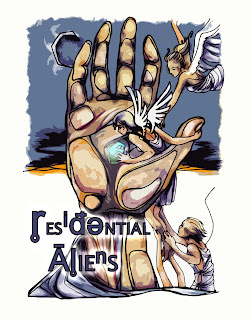 ResAliens Blog is a speculative fiction review site. I'm happy to consider reading and reviewing your indie published novel, but I can't guarantee it. Query me at lyngperry at yahoo dot com with some info and I'll get back to you. Visit ResAliens.com for Free Content!